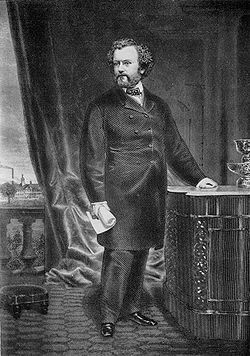 Samuel Colt was born in Hartford, Connecticut, to Christopher Colt, a farmer who had moved his family to Hartford when he changed professions and became a businessman, and Sarah Colt née Caldwell, who died before Samuel was seven years old. Christopher Colt was remarried two years later to Olive Sargeant. The Colt family included eight siblings: five boys and three girls. Two of the sisters died in childhood and the other committed suicide later in life, but Samuel's brothers were a huge part of his professional life. Colt was indentured to a farm in Glastonbury at age 11, where he did chores and attended school. At Glastonbury, he was introduced to the Compendium of Knowledge, a scientific encyclopedia that he preferred to read rather than doing his Bible studies. This encyclopedia contained articles on Robert Fulton and gunpowder, both of which provided motivation and ideas that would influence Colt throughout his life. While reading the Compendium, "he discovered that Robert Fulton and several other inventors had accomplished things deemed impossible—until they were done". Later, after hearing soldiers talk about the success of the double barreled rifle and the impossibility of a gun that could shoot five or six times, Colt "decided he would be an inventor and create the 'impossible' gun". In 1829, Colt began working in his father's textile plant in Ware, Massachusetts, where he had access to tools, materials, and the factory workers' expertise. Using the ideas and technical knowledge he had acquired earlier from the encyclopedia, Samuel built a homemade galvanic cell and used it to explode a gunpowder charge in the waters of Ware Lake. In 1832, Colt's father sent him to sea to learn the seaman's trade. Colt would later say that the concept of the revolver was inspired by his observations of the ship's wheel during his first voyage. He discovered that "regardless of which way the wheel was spun, each spoke always came in direct line with a clutch that could be set to hold it... the revolver was conceived!" On this voyage, Colt made a wooden model of a revolver. When Colt returned to the United States in 1832, he went back to work for his father, who financed the production of two pistols. The guns turned out to be of poor quality because Christopher Colt believed the idea to be folly and would hire only inexpensive mechanics. One of the guns burst upon firing, and the other would not fire at all. Later, after learning about nitrous oxide (laughing gas) from the factory chemist, Colt took a portable lab on the road and earned a living performing laughing gas demonstrations across the United States and Canada. It was during this time that he made arrangements to begin building guns using proper gunsmiths from Baltimore, Maryland. In 1832, at the age of 18, Colt applied for a patent on his revolver and declared that he would "be back soon with a model". Reproduction of an engraving taken from an oil painting displayed at Wadsworth Atheneum, Hartford, CT. 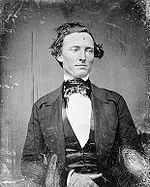 In 1835, Samuel Colt traveled to England, following in the footsteps of Elisha Collier, a Bostonian who had patented a revolving flintlock. Despite the reluctance of English officials to issue the patent, no fault could be found with the gun and he was issued his first patent (Number 6909). He then traveled to France to promote his invention, and there he heard about the emerging conflict between the United States and Germany. Colt wanted to serve his country, so he returned home. Upon his return, however, he learned that England had mediated the conflict and that there would be no fighting, so he set up a factory for the manufacture of his firearms in Paterson, New Jersey. Shortly after his return to the United States, Colt applied for a patent for a "revolving gun", and he was granted the patent on 25 February 1836 (later numbered 9430X). This instrument and patent No. 1304, dated August 29, 1836, protected the basic principles of his revolving-breech loading, folding trigger firearm named the Paterson Pistol. Colt never claimed to have invented the revolver, as his design was merely a more practical adaption of Collier's revolving flintlock, which was patented in England and achieved great popularity there. He did, however, greatly contribute to the use of interchangeable parts. "Unhappy with high cost of hand made guns, and with the knowledge that some parts of guns were currently being made by machine, Colt wanted all the parts on every Colt gun to be interchangeable and made by machine. His goal was the assembly line". This is shown clearly in a letter that Samuel Colt wrote to his father in which he said, "The first workman would receive two or three of the most important parts…and would affix these and pass them on to the next who add a part and pass the growing article on to another who would do the same, and so on until the complete arm is put together". It was this first "practical revolver and the first practical repeating firearm," made possible by converging percussion technology, that would be the genesis of what would later germinate into an industrial and cultural legacy and a priceless contribution to the development of war technology, ironically personified in the name of one of his later revolving innovations, the Peacemaker. Colt quickly formed a corporation of New York and New Jersey venture capitalists in April 1836. Through the political connections of the subscribers, the Patent Arms Manufacturing Company of Paterson, New Jersey, was chartered by the New Jersey legislature on March 5, 1837. Colt was given a commission for each gun sold in exchange for his share of patent rights, and stipulated the return of the rights if the company disbanded. Because the company's owners were reluctant to fund the new machinery to make the interchangeable parts, Colt went back on the road to raise money. Demonstrating his gun to people in general stores did not work, so with a loan from a cousin he went to Washington, D.C., and demonstrated it to President Andrew Jackson. Jackson approved of the gun and wrote Colt a note saying so. With that approval, Colt got a bill through Congress endorsing a demonstration for the military, but no appropriation for them to purchase the weapon. A promising order from the state of South Carolina for fifty to seventy-five pistols was canceled when the company did not produce them quickly enough. One recurring problem Colt had in selling his revolvers was that "it was not possible to change the provisions of the Militia Act of 1808. Any arms purchased under the Militia Act had to be those in the current service to the United States". In other words, state militias could not officially allocate funds towards the purchase of weapons not also used by the United States military. When Martin Van Buren assumed the Presidency in 1837, the ensuing economic crash almost ruined Colt's company. The company was saved by the war against the Seminoles in Florida which provided the first sale of Colt's revolvers and his new revolving muskets. The soldiers in Florida loved the new weapon, but "the unusual hammerless design, sixty years ahead of its time ... led to difficulty training men used to exposed-hammer guns and many curious soldiers took the locks apart. This resulted in breakage of parts, stripped screw heads, and jammed actions". Colt soon reworked his design to leave the firing hammer exposed, but problems continued and in late 1843, after numerous setbacks including loss of payment for the Florida pistols, the Paterson, New Jersey plant closed. Colt did not refrain long from manufacturing. Soon after the failure of his former company, while he was marketing the underwater electrical detonators that he had invented, Colt met Samuel Morse. They became friends and they both lobbied the U.S. government for funds. Colt's waterproof cable was valuable when Morse ran telegraph lines under lakes and rivers, and bays, and especially for attempts to lay a telegraph line across the entire Atlantic Ocean. When tensions with Great Britain prompted Congress to appropriate funds for Colt's project toward the end of 1841, he demonstrated his underwater mines to the U.S. government. In 1842 he used the device to destroy a moving vessel to the satisfaction of the navy and President John Tyler. However, opposition from John Quincy Adams, who was serving as a U.S. Representative from Massachusetts's 8th congressional district, and who personally disliked Colt, scuttled the project. After this setback, Colt concentrated on manufacturing his waterproof telegraph cable, believing the business would boom alongside Morse's invention. He began promoting the telegraph companies so he could create a wider market for his cable, for which he was to be paid $50 per mile. In 1847, Captain Samuel Walker and the Texas Rangers, who had acquired some of the first Colt revolvers produced during the Seminole War, ordered an additional 1,000 revolvers to use in the Mexican-American War. The large order allowed Colt to re-establish his firearm business. Because he no longer owned a firearm factory, or even a model of a firearm, Colt hired Eli Whitney Blake, who was established in the arms business, to make his guns. Colt and Captain Walker drew up a new improved model from which Whitney produced the first thousand-piece order. The company then received an order for a thousand more; Colt took a share of the profits at $10 per pistol for both orders. He later built the Colt's Patent Fire-Arms Manufacturing Company factory at Hartford, Connecticut. His revolving-breech pistol became so popular that the word "Colt" was sometimes used as a generic term for the revolver. The California gold rush and western expansion made the firearm business boom so much that Colt had to expand the Hartford factory repeatedly. During this period Colt received an extension on his patent because he did not collect on it in the early years. When someone[who?] infringed on the patent, Colt sued and the court ordered that Colt receive royalties on each gun that had been sold by the rival company. This caused the rival to go out of business. With a virtual monopoly, Colt began to sell his pistols in Europe, where demand was high due to tense international relations. By telling each nation that the others were buying Colt's pistols, Colt was able to get large orders from many countries who feared falling behind in the arms race.